I have visited The Square restaurant several times. It's one of London's best two stars. Its formality is reassuring and slick rather than inhibiting It's a place I enjoy. I had a wonderful surprise 40th birthday there (thanks B) with a dozen friends. When I heard that legend-in-his-lifetime chef Phillip Howard was producing a book giving detailed instructions on how to recreate his restaurant dishes, I was fast in with the pre-order. Most of the dishes are beyond my talent but it's invaluable for ideas, techniques and flavour combinations. The Square's soufflés are exquisite. Somehow they are packed with flavour but light, with a uniform foam but also unctuous (hateful word but no other will do here). It's quite a quivering trick. So this is Philip Howard's recipe. There are a few things wrong with the one pictured above. The foam is not consistent enough. Too many big bubbles. That's probably me not folding the meringue in sufficiently. But the flavour... It's brilliant... This dish is still in development. Basically, I need to make it better. More consistent texture, straighter rise, flatter tops. 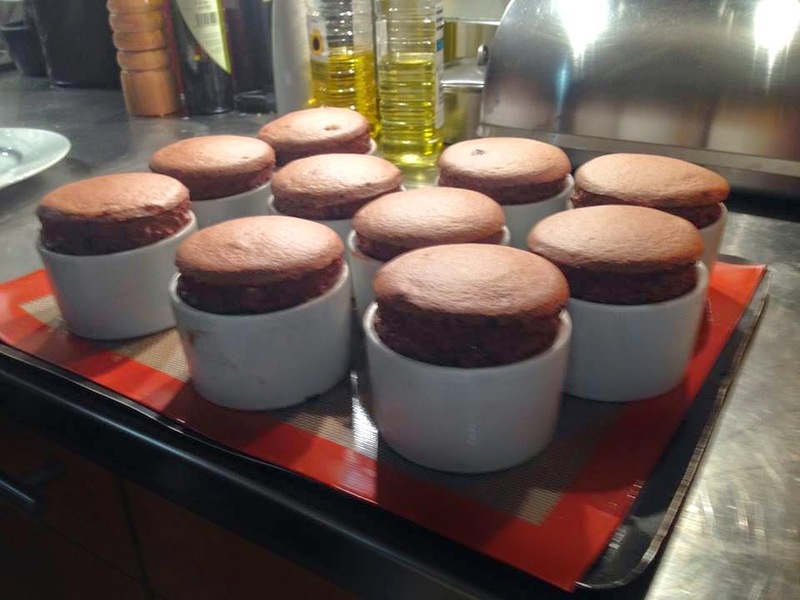 Sweet souffles are another one of those 'not nearly as difficult as their rep' foods. Also, the want-soufflé-eat-soufflé period is less than 30 minutes. Essentially, you make a flavoured pastry cream, mix in some meringue and bake. However, I can report that there are two things essential to making a great chocolate soufflé. Yes, you need some of this and one of those. Luckily, most of us have one of those and we can all buy some of this. 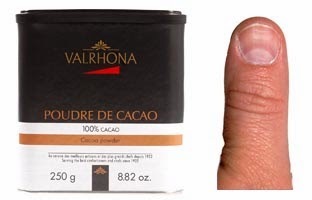 Valrhona cacao powder is the best. You will taste the difference. Its intensity means you can use less and avoid your recipe becoming, well, powdery. It's about £8.50 a box from here. Using soft butter, coat the inside of eight ramekins (5cm deep). Now stroke upwards in the butter so there are no mix impeding ridges. Coat the insides with finely grated chocolate (you can also use caster sugar but it won't look or taste as good). Put in the fridge to set (not that important). Scrape out the seeds of one vanilla pod and into a boiling pan of 425ml full fat milk, add the seeds and pod. Scald. In one hit add: 60g sifted plain flour, 30g cocoa powder, 30g grated dark chocolate (70% or higher) and 75g of caster sugar. Bring to the boil, whisking hard. The mixture will thicken much. Set aside to cool. Once cool, pash through a sieve to ensure a smooth, glossy consistency. Whisk 400g of egg whites (about ten eggs) until stiff, then whisk in 160g of caster sugar until firm and glossy. Take a quarter of the meringue and beat this into the chocolate base. No wait. In his book Phil says take 400g of the base. Now I know why he says this: in his restaurant some commis has spent the morning making kilos of the base and it's all there waiting to be scooped out. BUT, the quantities he specified earlier means you make over 500g. Why Phil? What do I do with the remainder (apart from bribing my owl-eyed, spoon licking liking, offspring)? That's poor form. It's a waste. And, yes, I've just repeated the error here. If you do take all of the base, you will get a slightly denser soufflé. Worse things have happened. Anyway, gently fold in the rest of the meringue. This is the Vegas-or-bust bit. Over-fold and your dish won't rise much, under fold and you'll get white streaks and a messy consistency. However, around the family dinner table, no one will complain. NOW. Run your THUMB around the side of the ramekin, creating a small groove in the mix (Indeep anyone?) only a few mm deep. This will allow your soufflé to rise vertiginously, just like they do on the telly. If you don't make the groove, the mix will cling to the sides, dome and then split as the inflated interior bursts out. Cook the soufflés at 180°C for about 12 minutes until well risen. Phil says eight or nine minutes. I have no idea why. I don't know what kind of space/time contracting oven he's using but an eight minute soufflé in my righteous Neff looks a lot like a four minute soufflé. You'll have to experiment. What a shame! I like to serve mine with a very dark, warm chocolate sauce plunged into the centre with a spoon. Equal amounts of cream and grated chocolate heated gently until it's dark and glossy. Then add just a pinch of salt, á la Heston. Takes about two minutes. Maybe a vanilla ice-cream or a pistachio cream? Now, what to do with those ten egg yolks? Could be a lemon tart or maybe my honeycomb ice cream? PostScript: I managed to side-straighten and top-flatten. This was the result, serving to a party of ten. Makes your chest swell.